Prof. 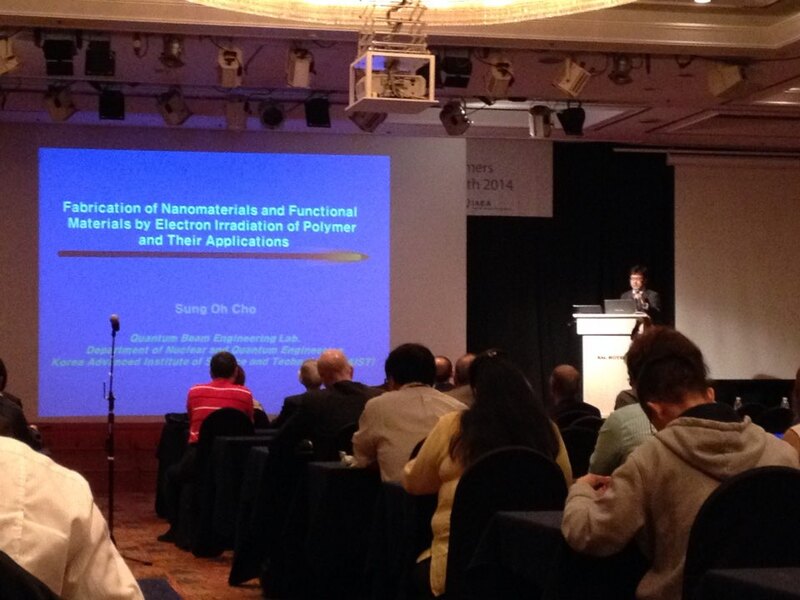 Sung Oh Cho gave a keynote speech in an international conference, Ionizing Radiation and Polymers (IRAP). IRAP conference was initiated in 1994 and has been organized every two years. The 11th conference was held in Jeju Island on October 5th – 9th, 2014. Around 230 scientists and engineers attended the conference from 27 countries around the world. Prof. Cho has worked in the field of electron irradiation on various materials for last 10 years. He was invited to give a keynote speech at this conference due to the excellent achievements of his Lab. in this field. The title of his keynote speech was “Fabrication of Nanomaterials and Functional Materials by Electron Irradiation of Polymer and Their Applications”. His group, Quantum Beam Engineering Lab., produced many unique and interesting nanostructured materials such as nanoporous polymers, non-closepacked carbonaceous materials, nanotrees, sponge-like nanostructures, and graphene in addition to functional materials including organic semiconductors, photocatalysts, and luminescent polymers with the use of electron irradiation method. He introduced these results and got great response from the researchers attending the conference.